Who says home-made ice cream is difficult to make? 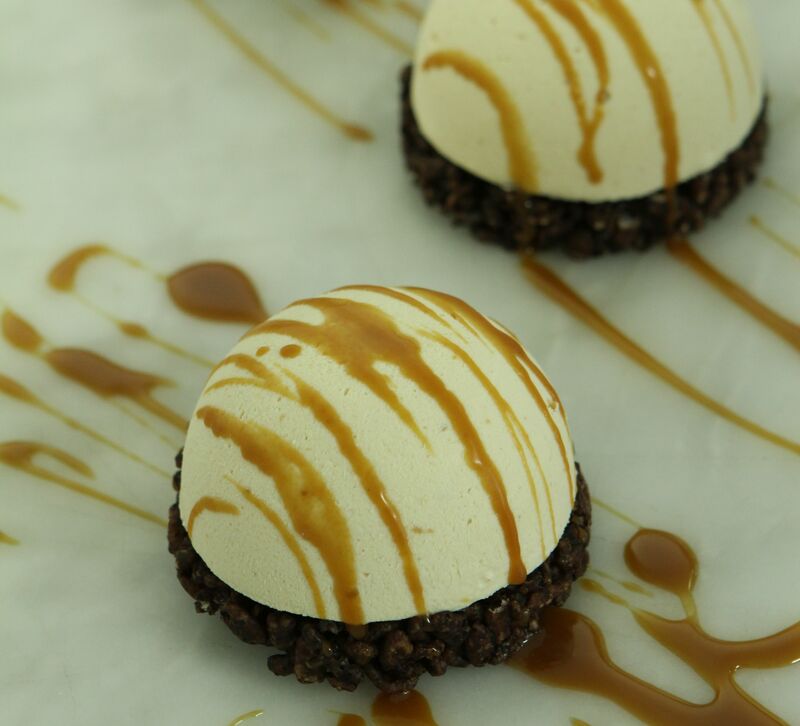 This Peanut Butter Ice Cream with Caramel Sauce with a biscuit base is sure to be everyone’s favourite dessert. This recipe was first published in Flavours magazine. In a bain-marie, melt the chocolate. Mix it with the cereal. Press lightly into 7cm-diameter ring moulds set on a tray lined with parchment paper. Set aside in the fridge. Cream sugar and egg yolks. In a saucepan, combine milk and peanut butter and bring to a boil. Pour half the milk mixture onto the egg yolk mixture and whisk until well-combined. Add the rest of the mixture and cook, stirring continuously over low heat, till 83°C, and the mixture can coat the back of a spatula. Transfer immediately into a mixing bowl and refrigerate until cold. Whip the cream to the stiff peak stage. Mix milk mixture with whipped cream and pipe into 7cm half-sphere or muffin silicon moulds. Freeze till solid. Remove ice cream from moulds, and place on top of the chocolate crisp bases. Serve plain or with caramel sauce.